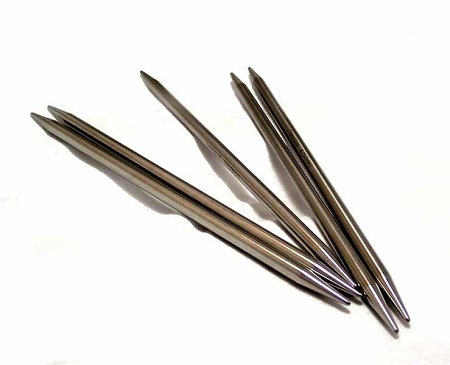 ChiaoGoo premium stainless steel double point needles feature precisely machined and perfectly tapered tips with a smooth satin-sheen finish. The needles are 6 inches in length and come in sets of 5. Each needle is laser-imprinted with the size. just got these in today. really love the difference in how the pointier tip picks up wrapped stitches on a toe up sock. normally this part hurts as I have artheritis in my hands. they were already sore today when I tried these new needles. didn't hurt at all because I didn't have to force the needle into the stitch to pick it up. even the double wrapped stitches were easier to pick up. and as a result knitted that part faster as well. so less pain when I am already sore is a plus for me I can enjoy my knitting more. I am a huge fan of the ChiaoGoo Red Lace circular needles and when I learned they also made stainless steel dpns, I just had to try them. For my sock and other small circular knitting, they are top-notch - the perfect blend of grippy enough to keep my stitches from sliding off but sleek and pointy enough to allow me to quick knit cables, lace, etc. I have tried pretty much every dpn made and I can easily say these are my favorite. In addition to great performance, they are so reasonably priced. You can't go wrong with these (and Handsome Fiber's customer service and shipping speed.) fyi, I am not affiliated with either ChiaoGoo or Handsome Fiber, just a very satisfied customer! Q: Are these square needles or round? There are both styles in the photo. Thank you. Q: Are the tips of these like the regular Red tips, or the Lace tips? Thanks!